“Advent” means “coming” or “arrival”. Traditional Christian churches designate the four weeks before December 25th, when we commemorate the birth of Jesus Christ, as the Advent season. Although no one knows the exact date when God Himself came to Earth to take our place in death so that legally He could forgive our sin. Advent is a tradition worth continuing. In it we can emphasize the still-future Second Coming of our Lord in splendor and glory, as well as His historical First Coming in humility and sorrow. Both can be done with the Advent candle holder. With each candle representing a prophetic Scripture, this holder is one of the most beautiful and meaningful objects we can have at the Christmas season, particularly for children. It is neither difficult nor expensive to make, and is an excellent way to incorporate prophecy with family devotions. It will grow more precious each year and remembered for a lifetime. If children are older, let them take turns lighting candles. If they are very young, let them take turns blowing (or snuffing) them out. (If blowing them out, hold a card behind each candle so wax won’t splatter). On December 1st, light and recite John 3:16. This is what Christmas is all about, so talk about it. Memorize it word for word. Then light the extreme left-hand candle, Genesis 3:15. It is the first promise of the Saviour, embracing all others. Read Genesis 3 from the Bible (or Bible story book if the children are tiny). Discuss what happened. Explain the memory verse. Ask questions: “To whom did God give the first promise of the Saviour? Yes, to Satan our enemy, who caused man’s fall. Someday he would be crushed by God’s Son on the Cross. Jesus is the ‘Seed of the woman’, born from Mary who descended from Adam and Eve — but His Father is God.” Memorize this verse also. Afterwards each one may pray aloud. Sing a spiritual Christmas carol or hymn as time allows. On December 2nd, light the candle for John 3:16; say it together, always starting and ending with the Scripture reference. Next light Jude 14 on the extreme right. This is the first reference to the SECOND COMING of Christ, given by Enoch before the Great Flood and before he walked right into heaven without dying. (Genesis 5:21-24) Allow time for discussion and memorize the verse. On December 3rd, light John 3:16 in the center, followed by Genesis 3:15 on the left and Jude 14 on the right, repeating each verse as it’s candle is lit before going to Genesis 12:3 on the left. Follow this pattern through Christmas Eve, lighting candles and reciting verses in the order in which they were learned, alternating promises on the left with promises on the right from outside towards the center.The white candle always is lit first and blown out last. 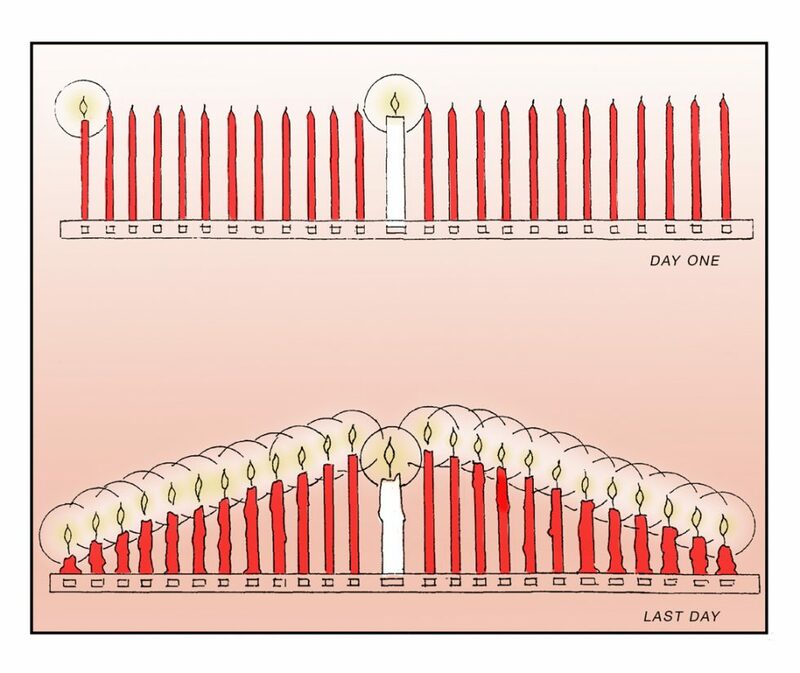 By Christmas Eve the candles from both ends will taper upwards towards the center, showing that all prophecy is fulfilled in Jesus Christ — and you and your children will have memorized 25 Scripture verses! What better way can we prepare our hearts to welcome the King? In a 2″ x 4″ board 66″ long, drill holes ¾” in diameter by ¾” deep every 2½” on one 4″ side. There will be 25 holes in all. You may stain and varnish the wood, and round out the front corners. Purchase 24 red candles (10″ or 12″) and one large white candle. The verse for the center candle is John 3:16.